I adore the first photo by Joanna Kustra! Isn't it dreamy and beautiful? Oh she's one of my favorite photographers! 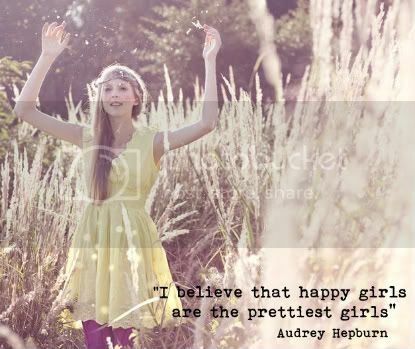 ♥ I added one of my favorite Audrey Hepburn's quotes to the photo, I just love that little quote! Thanks for your lovely comments, they always make me smile! I promise I'll be visiting and commenting on your lovely blogs this weekend :) On another note I'd like to announce the winner of the Kellyssima giveaway...the winner is Jamie from the lovely blog With Love Congrats Jamie!Thanks everyone for participating! Hope you have a wonderful weekend! Me encanta la primera foto de Joanna Kustra, una de mis fotógrafas favoritas. Agregué a la primera foto una de las frases de Audrey Hepburn que me gusta mucho. Gracias por sus lindos comentarios siempre los leo y me alegran el día. Prometo ponerme al día con sus blogs este fin de semana :) siempre disfruto leerlos! Beautiful photos, my favourite is the 3rd one down!! The first is my fav too and the quote! Besos y te espero por mi blog!!! the second pic is so happy! loved! these photos are so happy, makes me dream of summer and warm weather, which we are finally having in my neck of the woods after a week of rain! Yay! I won those beautiful earrings?! Pretty photos, by the way! I love these pictures. 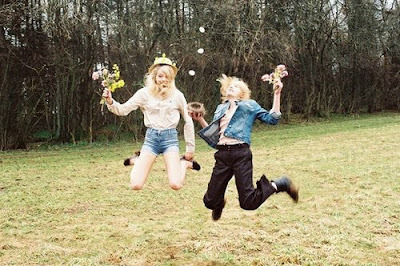 I want to do more happy pictures. And that quote is soo true. I love these pictures. The definitely put a smile on my face! The last one is my favourite. love these pics! they make me so happy!! i just wanna run through fields wearing yellow dress w purple tights! Congrats to the winner! Those images are awesome, and I have always loved that quote. these are so amazing i love them all! love the photos and that audrey hepburn quote! i'm also loving your blog. i've been following you on twitter through and FF but this is the first time i've been to your blog. i am your newest follower. glad to meet you! un post genial, como siempre! !las fotos son estupendas!! Giovanna this posting is so inspiring..Thank you..
and audrey's hepburn quote fits perfectly..
Oooh! I love the fourth pic the best - both nature-y and happy! I love all of the photos, so happy! These photos just made my day! Con tanto viaje y tanto trabajo, hacía tiempo que no me pasaba por tu blog. Esta producción es preciosa. Me encantaron los vestidos de la última foto.